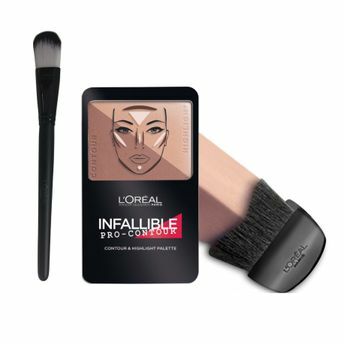 Pro-contouring made easy in a palette with the Infallible Pro Contour Palette. Designer fish-tail sculpting brush fits cheekbones perfectly and picks up light shade and dark shade at the same time for highlight plus contour in just a single stroke! Long-wearing formula that lasts all day, these ultra-blendable powders give a flawless finish! Now enhance, sclupt and define your features easily uisng this amazing contour palette! Get that perfect contoured look with this duo-palette. Features a professional sculpt brush that defines your look easily.